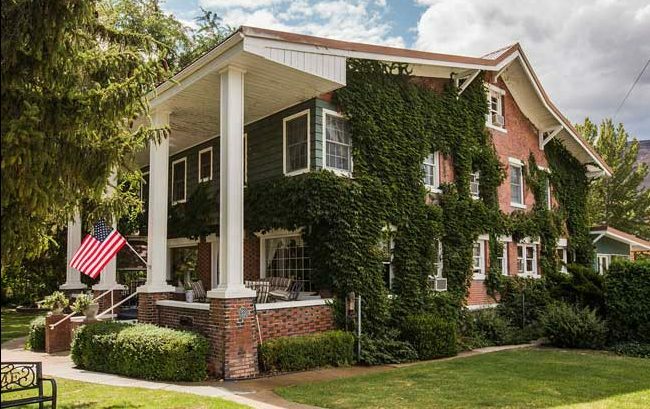 The Warm Springs Inn and Winery is a six-suite mansion that was built in 1917. 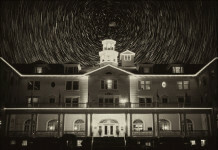 Photo courtesy Warm Springs Inn and Winery. Choosing the perfect place to call home while traveling can be difficult. There’s an abundance of options to pick from, and you don’t always know what you’re getting until you get there. The best home-away-from-home should be more than just a place you lay your head at night. It should be unique and comfortable, a place worth writing home about. On your next trip to Washington State, skip the hotel and opt for a more intimate setting in one of our five favorite bed and breakfasts. 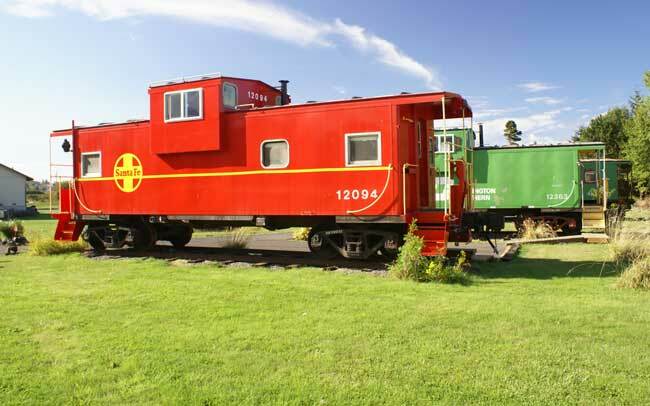 Some hotels brag about how green they are, but they have nothing on the Red Caboose Getaway B&B. Owners Olaf and Charlotte Protze have transformed more than 2.5 acres of weed-covered city land into an off-the-rails, train-themed B&B. They dug a pond, which is now a certified wildlife habitat, planted over 100 native trees, and recycled nine steel cabooses. Each caboose weighs approximately 20 tons and sits 3.5 feet off the ground on railroad tracks laid on a gravel bed. The Red Caboose Getaway was built by owner Olaf Protze, who was raised in Alberta, Canada, and found the love of his life, Charlotte, in San Mateo, California. After raising three children in the San Francisco Bay area, the Protzes decided to ditch the traffic and embrace a more peaceful setting. After researching places to live, they found the friendly, quiet town of Sequim and decided it was the ideal place to establish their B&B. The Protzes look for unusual cabooses, like their 1942 Pennsylvania Porthole caboose, or their latest edition, a rare 1969 stainless steel Kansas City Southern caboose. The rooms are comfortable and unique. Talk about an unforgettable place to stay. 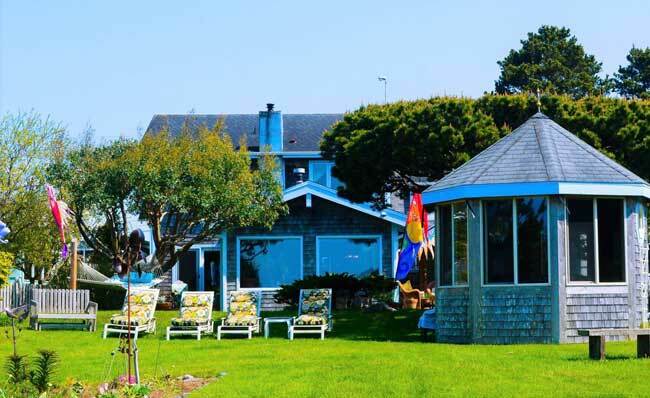 The Boreas Bed & Breakfast Inn in Long Beach has a beautiful location near the ocean. Photo courtesy Boreas Bed & Breakfast. Boreas Bed & Breakfast Inn is mere feet from the Pacific Ocean, yards from a charming seaside downtown, and light-years from the ordinary. It is home to the quintessential Pacific Northwest gourmet experience and embraces the extraordinary – ocean views, memorable sunsets, and brilliant, expansive gardens with multi-course breakfasts highlighting each morning. Guests can walk the private beach trail leading to Discovery Trail, a 20-mile paved path that skirts the Pacific Ocean and leads walkers and cyclists to the stunning North Head Lighthouse at Cape Disappointment State Park. They can also stroll down the Long Beach Boardwalk, just a few blocks from the inn, where myriads of kites routinely grace the skies. Susie Goldsmith and Bill Verner have owned Boreas Inn since 1996, and they have honed their culinary expertise and destination travel acumen as proud and loving innkeepers. They delight in introducing their guests to their favorite viewpoints, hiking routes, galleries, and restaurants. Bill is originally from the Boston area, but has called the Northwest home for decades. Susie grew up in Lake Oswego, Oregon, and her old-Portland family has been vacationing in the Long Beach area since the 1890s. A love of cooking and good food was taught to both of them at an early age by parents who were excellent in the kitchen. This six-suite, 1917 mansion turned luxury B&B conjures up a Gone with the Wind ambiance. Guests enter the property along a 300-foot rose-lined drive to a stately home which looks transplanted straight out of the Old South. It sits on 10 acres of old growth shade trees, manicured gardens and is next to 10 acres of cherry orchards. On the banks of the Wenatchee River, Warm Springs Inn is in the heart of Wenatchee Valley in premium wine country and offers tastes of some of the area’s best wines. The Szmania family produces Brender Canyon Vineyard estate wine from their farm nearby in Cashmere. You can enjoy a bottle of wine anywhere on the majestic grounds, or head inside to relax in the riverfront lounge with its limestone fireplace, French doors, and scenic views of the mountains. Critically acclaimed Executive Chef Ludger Szmania and his business partner (and wife) Julie, own the idyllic Warm Springs Inn & Winery. After living in the Seattle restaurant scene for the last 24 years, they decided to sell their much-loved neighborhood bistro and start a new life. Warm Springs Inn & Winery is now the couple’s creative outlet for fashioning delicious breakfasts, offering world-class hospitality and introducing visitors to their love of and wine-making. Ludger procures a bounty of locally-sourced farm-to-table ingredients whenever possible. Two of his many signature breakfast dishes are the Wenatchee Apple Dutch Baby and Alaskan Smoked Salmon Eggs Benedict. It’s all in the name at A View With A Room Bed and Breakfast. 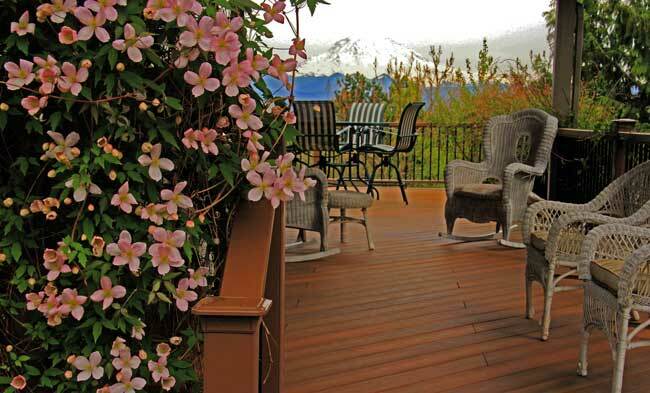 Mount Rainier is right in the backyard, and every pillow in the house has a view of this incredible mountain. The dwelling is nestled between old growth cedars and hemlocks, where hummingbirds show off their acrobatics for anyone willing to watch. The gardens on the property are made up mostly of hand-me-down and rescued plants from neighbors and friends and are arranged haphazardly to maintain its standing as a wildlife sanctuary. It’s not uncommon to see deer ambling through the gardens and napping among the flowers. The B&B space is located on the entire lower level of a large home (with a private entry, of course) which boasts a large common area with game table, cable TV, and a “grab-able” library. A three-course breakfast, commonly reported to “last till dinner,” is served anytime the guests choose. Zoom and Lenny are the innkeepers at A View With A Room. Zoom moved to Puyallup when he was very young and grew up thinking Mount Rainier was “his.” He knows every spot along every road to catch the best view. He graduated from Puyallup High School and attended the University of Washington. He retired in 2015 from a career as an accountant. Lenny is a native of Minnesota who relocated to Washington in 1978 and fell hopelessly in love with the area and Rainier. The two married in 1999 and Lenny moved into the house Zoom built in 1985. She had a vision and a dream of being an innkeeper someday and the room and the view were calling out to be shared. 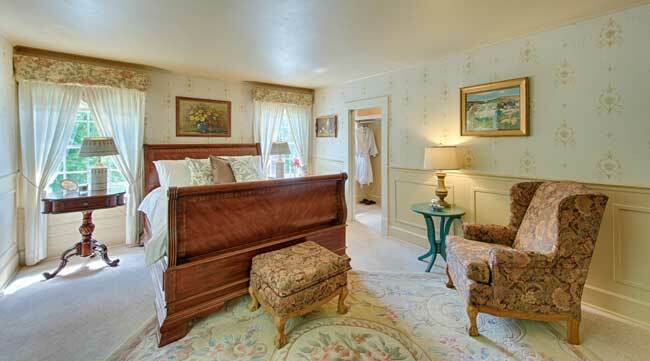 Domaine Madeleine’s claim to fame is that it was the first luxury bed and breakfast opened on the Olympic Peninsula. 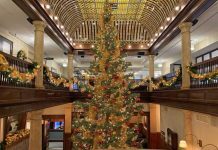 Twenty-five years later, the inn has reinvented the bed and breakfast experience for a new generation of travelers. Serving as a base camp to explore Olympic National Park, the suites and cottages echo the iconic landmarks from the Hoh Rain Forest to Hurricane Ridge, and feature immersive murals and original art inspired by its natural surroundings. High on a bluff with commanding views of the Strait of Juan de Fuca and the San Juan Islands, Domaine Madeleine features the latest in comfort and personalized guest amenities including Google Cast in every room, property-wide Wi-Fi, intimate gardens, renowned gourmet food, and friendly knowledgeable hosts. Stephen Fofanoff and Chris Warnock own Art and Soul Hospitality LLC, which manages the inn. Their mission is to craft authentic experiences that exceed their guest’s expectations. After years spent creating and managing attractions, retail, and hospitality businesses, Stephen and Chris now focus on managing upscale hospitality properties throughout the Pacific Northwest that inspire the spirit and rejuvenate the soul. 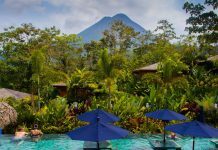 Whether you are looking to get out of the standard hotel-style room or you want to feel more connected with the place you are staying, these out-of-the-ordinary bed and breakfasts will add a unique and personal touch to your next getaway.